And we can return instance of any subclass of Interface List. But in scala, if we use trait or superclass in function declare statement, the result should be the type exactly declared . So, can we declare return type using upcast like Java? val list = new ListBuffer[AnyRef] this would fix your problem. You could also cast your buffer when your return it, i.e. 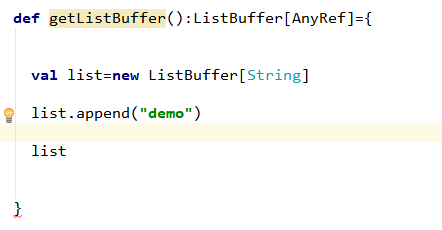 list.asInstanceOf[ListBuffer[AnyRef]], but casting is generally less safe, so that shouldn’t be preferred here. Note: String <: scala.this.AnyRef, but Java-defined class ArrayList is invariant in type E.